Embedded within the wooden exterior of the cabinet is a EuroCave Performance Wine Cellar, which remains the best of the best from EuroCave. Individually handcrafted in a thirty-step process, the EuroCave Performance 183 will provide years of smooth, quiet, vibration-free service with the utmost ease of operation. 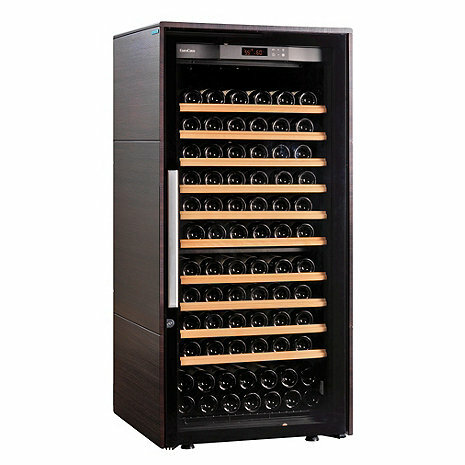 Stored in these true wine cellars, your finest vintages will develop to their full potential. Also, the security lock and key will keep your valuable collection protected. The single temperature cabinet re-creates the natural deep cellar and ensures a constant optimum temperature between 55°F and 57°F, but has a temperature range of 41°F to 68°F. The hygrometer provides an LCD display to advise of humidity range. Built-in alarm alerts when humidity level has fallen below 50%. Water can be added to cassettes to increase humidity to optimum range of 50-80%. Comes standard with 3 MDS Rolling Shelves, 1 Adjustable Shelf, and 1 Display Shelf, all made of eco-certified beechwood. How much extra are the rest of the rolling in shelves? We sell a 3 pack for $239 or a 6 pack of rolling shelves for $399. with any questions or to order.